System-scorching overclock, but what about the crash and burn? Over the last five years, overclocking has made the almost effortless leap from the realm of the solder-happy tweaker to the mainstream PC community. Indeed, it's such an important part of modern PC tech that all new motherboards, processors and some new graphics cards are sold on how much extra they give you for free. Overclockers UK is hoping to get you to part with your upgrade cash by giving you a free 1GHz+ overclock, but will you end up paying for it in other ways? We're seeing an increasing number of factory-overclocked rigs coming out of the system integrators as the norm, and there's nothing wrong with that. Despite the fact that the machines are operating well over stated frequencies, the manufacturer's warranty gives you the peace of mind you don't get clocking things yourself. You also get the reassurance of knowing that, despite the extra stresses on your rig brought about by the overclocked components, all the bits work together and will continue to do so for the foreseeable future. So that should ring true for these overclocked bundles, right? Well, no. The components are tested together to ensure they'll run overclocked happily once they get to you, but these bundles aren't full systems. While the CPU, motherboard and memory make up the core of your machine, you'll have to add things, such as the GPU and power supply, which can make a big difference. Overclockers UK has tweaked this Core i3 so it runs at a lightning-fast 4GHz. The problem is that it doesn't always do so. The first time we plugged it into our test bench it stuttered trying to hit the overclock and booted at stock speeds. It would eventually boot into Windows after many aborted attempts to POST and trips into the BIOS. Overclockers UK guarantees stability, but only with a 'quality brand PSU' so if it doesn't believe your PSU to be from a good enough brand it may not honour that promise. There's also the problem that you won't be able to update your motherboard's BIOS without invalidating the warranty. There's little safety then in picking up a specific overclocking bundle. 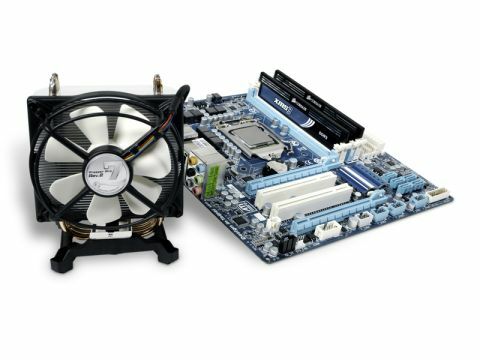 You save £3 on the listed price of the components and get some overclocking know-how in the BIOS, but the rest of your PC might take umbrage at these new components and not play nice. This isn't a safe way to avoid the hassle of overclocking. A full OC system will work out of the box and won't give you the problems you could find with a bundle – or you could forget serious overclocking until you've got the know-how.